Jannet el Firdaus 9ML CPO Alcohol free swiss arabian perfume. 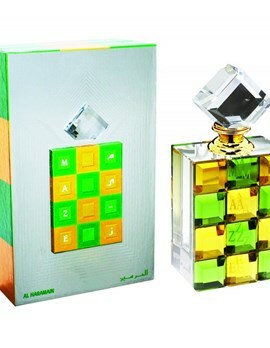 Renowned Givaudan Perfume by Swiss Arabian Perfumes, Featuring the distinct scent of Jannet el Firdaus. Size 10 ml. Jannet el Firdaus name is derived from the Arabic word meaning The 'Highest Paradise'. The roof of this heaven will be the throne of Allah according to Islamic beliefs. This fragrance is wild and musky that will leave you and your friends mesmerized. This fragrance will lift your spirits. This fragrance is unique in every way and will astound your senses. - Givaudan's original Jannet el Firdaus perfume. - Certificate included in each bottle. Pamper yourself with this unique, intriguing perfume. High quality packaging complements this original, fine perfume oil. For any Arabic perfume lover this fragrance is hard to resist, a must try. The World famous Swiss Arabian in association with Givaudan Roure is the oldest perfumery house in the Arabian Gulf. They produce high quality, desirable fragrances that are very well received by men and women all over the world. Swiss Arabian concentrated perfume oil “Attar” is alcohol free, safe to use. This genuine World famous Swiss Arabian concentrated perfume oil is high quality and longer lasting and is free from alcohol; a little of this delightful, high quality, exotic, longer lasting concentrated perfume oil goes a long way. Surely this perfume is a true delight to wear. The Islamic Establishment - Online Islamic retailer with a large range of Islamic Clothing, Books, Audio, Perfumes, Ornaments, Bakhoor, Jewellery, Health Products, Electronics and much more! Online Islamic retailer with a large range of Islamic Clothing, Thobe, Daffah, Oud, Bakhoor, Audio, Perfumes, Jewellery, Health Products, Electronics and much more!